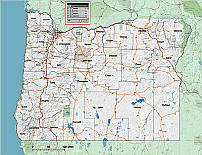 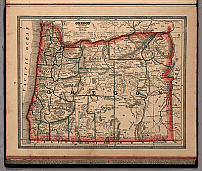 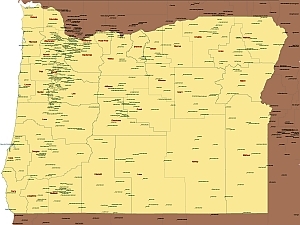 Editable royalty-free map of Oregon, OR in vector-graphic online store. 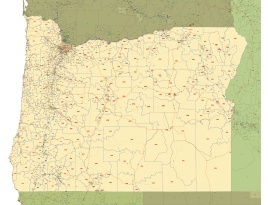 Oregon State vector road map. 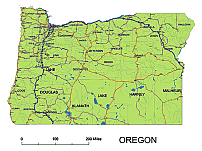 OREGON IS A STATE located on the west coast of the UNITED STATES and has a landscape for just about everyone: mountains; FORESTS; plains; DESERTS; the Columbia River Gorge; waterfalls such as Multnomah Falls (620 ft or 189 m), the tallest in Oregon and the fourthtallest in the country; Mills End Park, the smallest park in the world at 24 in (61 cm) across; and Hells Canyon, the deepest gorge in North America. 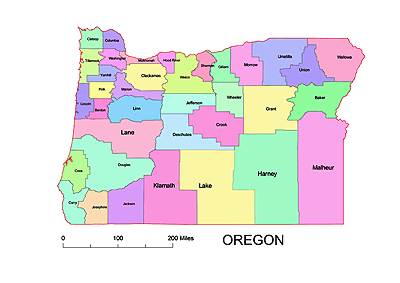 Eight regions divide Oregon: the Coast Range,Willamette Valley, Cascade Mountains, Klamath Mountains, Great Basin, Blue Mountains, Columbia Plateau, and Snake River.